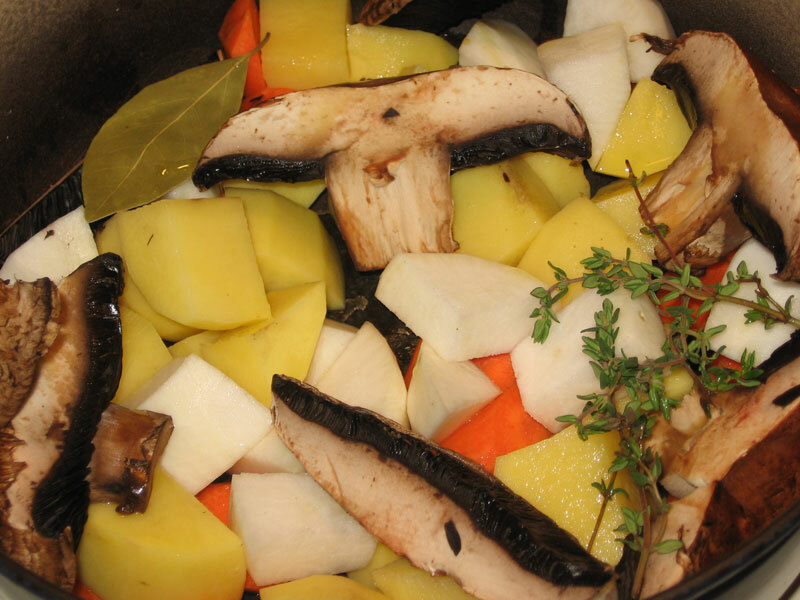 It all started out with the broth. A hearty mushroom based broth that is so thick you can’t see through it. With that already made, I didn’t have much to do. 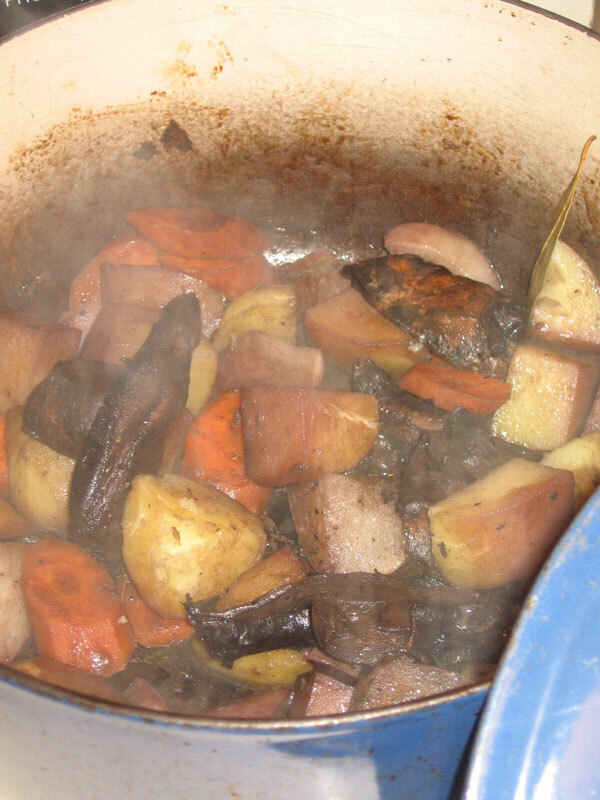 Cut up and roast the vegetables, with aromatics and red wine. 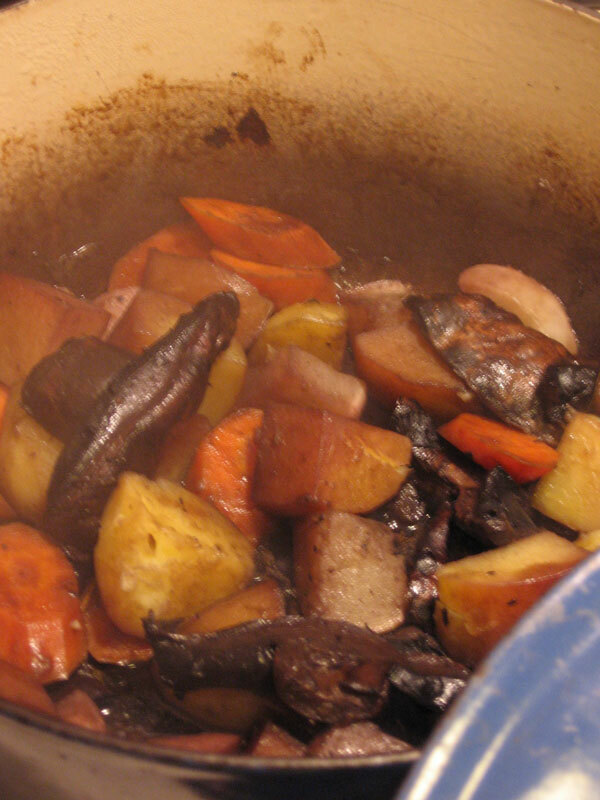 Turnips, carrots, portobello mushrooms, potatoes, and several sprigs of thyme. The vegetables were easy to roast. I stuck them into my large le creuset pot, tossed them with olive oil, poured in a little red wine, put the lid on, and stirred them occasionally. After about 20 minutes I took the lid off, and cooked them until they were tender and caramelized. Meanwhile I mixed up the batter for, and cooked the dumplings. They were rosemary dumplings, with an egg, some flour and a lot of fresh rosemary chopped very finely. 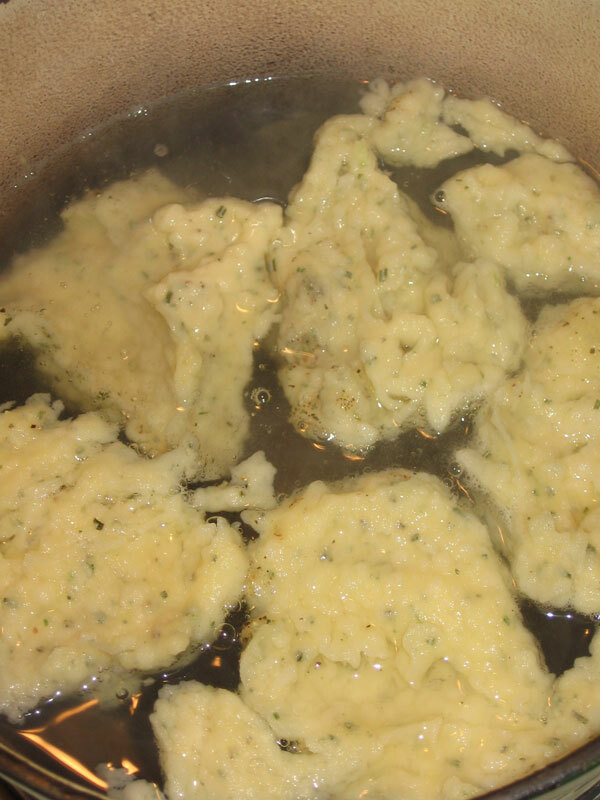 For some reason the dumplings ended up too mushy, and full of water. I am going to have to look at the recipe and maybe compare it to some other ones to see what to do differently next time. Also, I salted the water as I do pasta water, and this turned out to make them a little too salty. That said, I still liked them in the soup.. 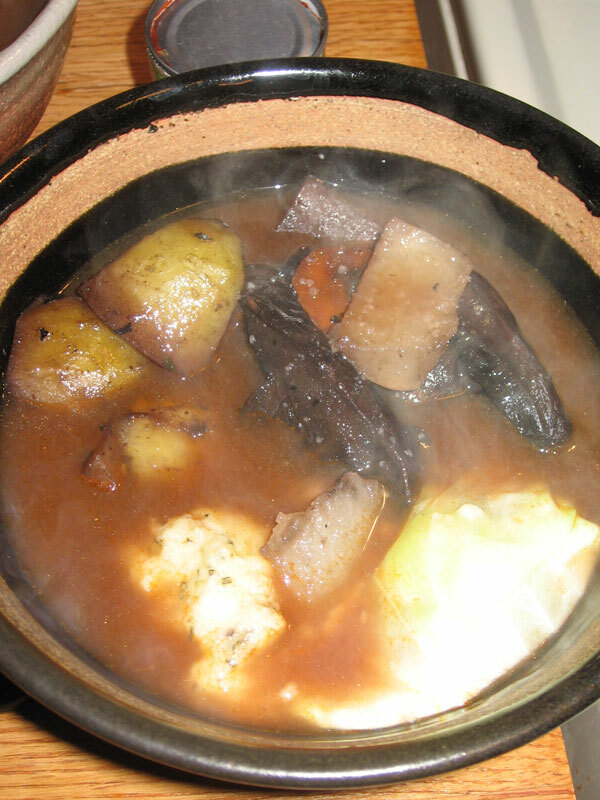 The finished bowl, before adding broth. I heated the bowls in the warm oven before putting the food in. 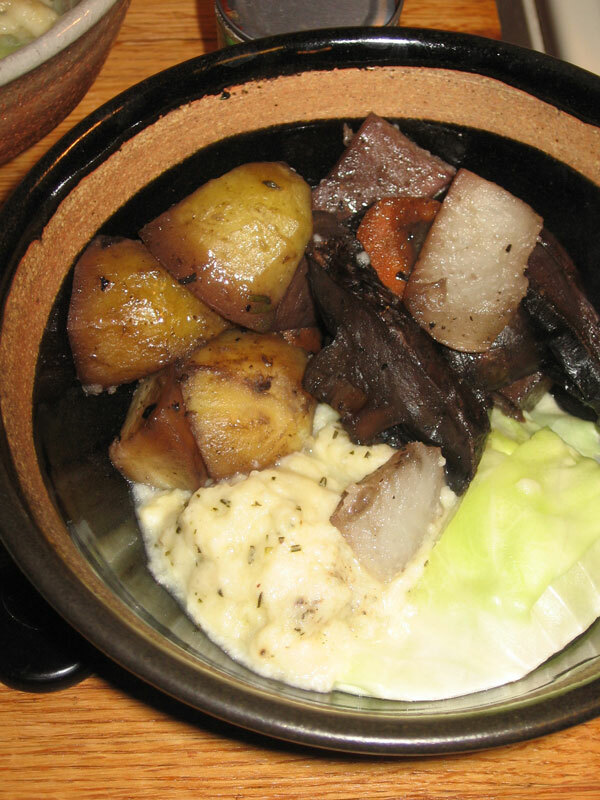 I arranged the roasted vegetables, dumplings, and a wedge of steamed cabbage. The broth, poured on top. It was so thick and rich, that one big bowl of soup left me stuffed!